May 7, 2018 – Kansas City – Boulevard Brewing and Strange Music today announced that fans will soon have the opportunity to celebrate a collaboration between two Kansas City originals – Boulevard and Tech N9ne. Inspired by one of Tech N9ne’s best-loved tunes, Bou Lou is an enticing improvisation on Boulevard’s Unfiltered Wheat Beer, bursting with flavors of pineapple and coconut. 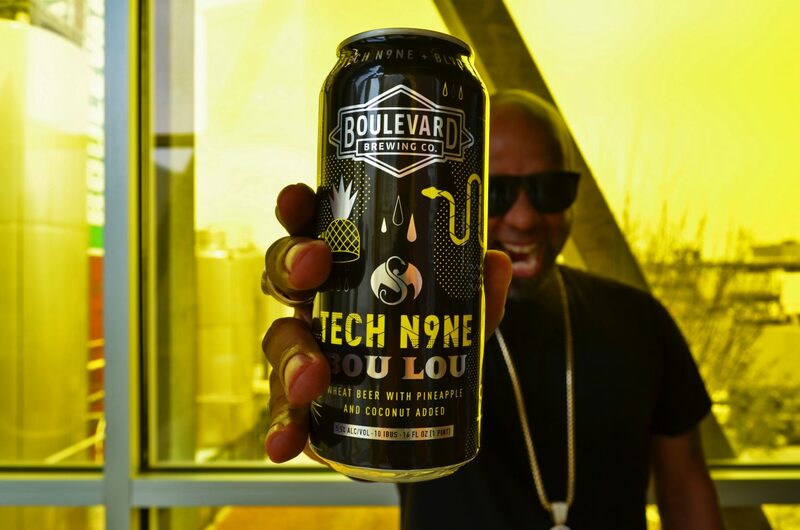 Boulevard Brewing and Tech N9ne have deep roots in Kansas City. Boulevard released its first beer in 1989. Two years later, Tech N9ne began his musical career. In the years since, both have flourished beyond their wildest dreams, becoming institutions in their shared hometown and parts well beyond. The limited release beer will debut at this summer’s Boulevardia festival, to be held June 15 and 16 in KC’s Stockyards District. Tech N9ne will top the bill at the urban street party on Friday night. Bou Lou, packaged in 4-packs of 16-ounce cans, will hit shelves starting Monday, June 18 in select markets including Kansas City, Lawrence, Wichita, Springfield and Denver. Strange Music, Inc. is the most successful independent hip hop record label in the world, founded in 2000 by the label’s flagship artist, Tech N9ne, along with business partner and CEO/President Travis O’Guin. With a diverse roster of artists, the label’s influence and reach continues to expand as evidenced by the recent addition of their pop music division, Strange Main. For more information about the label and its artists, visit strangemusicinc.com or follow facebook.com/StrangeMusicInc, twitter.com/StrangeMusicInc and Instagram.com/strangemusicinc.